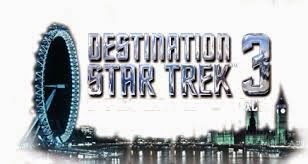 Destination Star Trek London - A Day By Day Review. 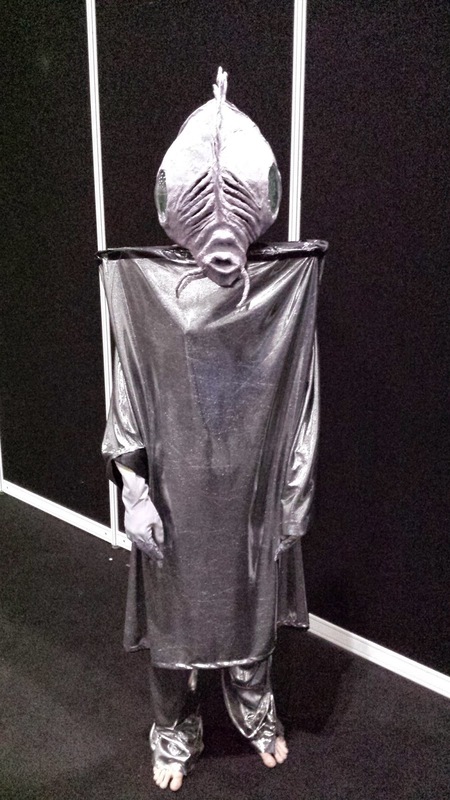 I've just got back from a fabulous weekend at the Excel in London where Destination Star Trek was taking place. With plenty of guests, events, talks and fellow Star Trek fans it promised to be a weekend to remember. Here's my take on the weekend. I, along with a friend started out from South Wales just after 8am and arrived at our hotel around 2pm. The event was taking place at the Excel in London so our hotel (Travelodge, Excel) was an easy five minute walk away. Friday's schedule consisted of a couple of photo shoots for me including a Borg Chamber photo shoot with Jeri Ryan and a double photo shoot with my friend, Chris with director, Nicholas Meyer. The floor was relatively quiet so gave us a good chance to wander around the stalls and get familiar with the land. 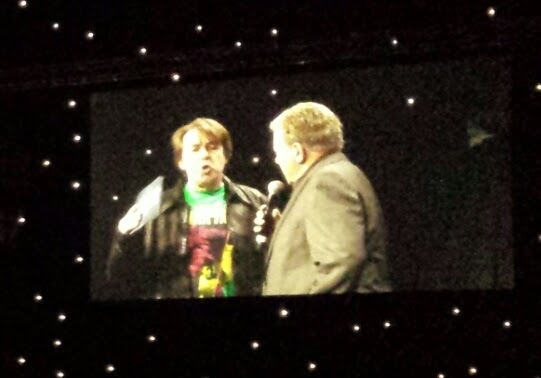 I also had to exchange my £50 credit I had as a result of Jonathan Frakes cancelling. I intended in exchanging this for Colm Meaney who would complete my Deep Space Nine cast photos. The queue for the photo sales was not that big and was moving quickly. The organisers had plenty of staff handling sales and another member of staff was handing out a check sheet and pens for you to hand over once you got to the sales desk. A nice touch. My only gripe with the process was I was unable to swap my £50 credit for a photo with Meaney and an autograph. (The autograph ticket sales were in another location.) As the autograph sales were using a token system, I don't think it was caused much aggro if they had a load of tokens on the photo sales desk too in the event of the credit exchanges. Once armed with my photo exchange I headed over to my first photo shoot. Jeri Ryan in the Borg chamber. This had a slight clash with Nick Meyer. I queued up and after 20 minutes I realised there were two queues. One for Jeri Ryan and another with Jeri Ryan and Alice Krige. I realised this was going on but the queue I was supposed to be in was on the other side of the booth. The member of staff had only been telling people who were by the booth and not at the end of the line. I asked the member of staff who was helpful what I should do and he said to go and get my Nick Meyer photo taken first. The Nick Meyer photo was as I expected very short and took ten minutes at the most. That was a bit of fun as it was a double shoot with my friend. 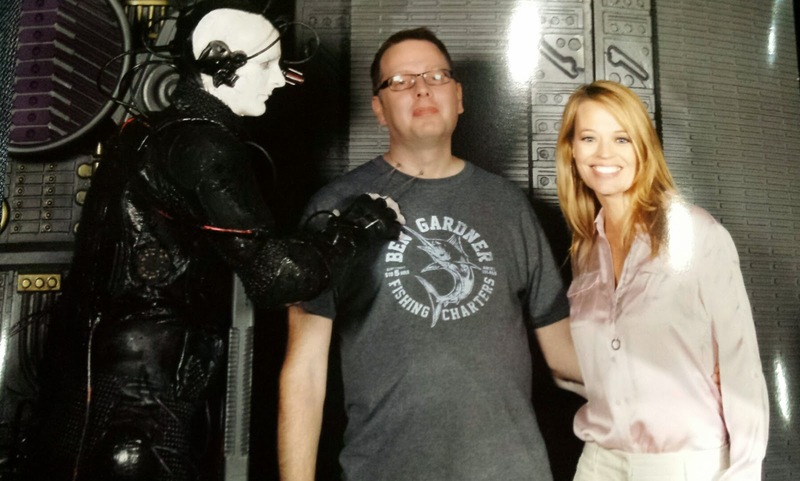 Once done I headed over to the Jeri Ryan queue (the right one this time) and had a great photo with Seven of Nine and a Borg assimilating me. As far as photos go for the day that was it for me. 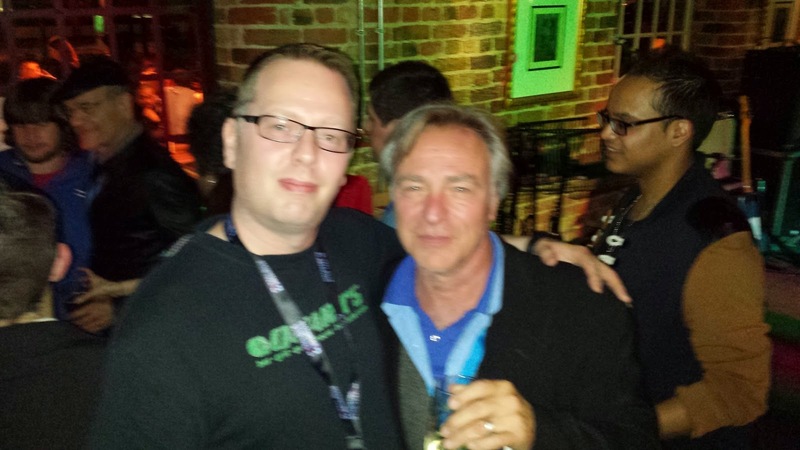 My friend still had the triple shoot with Brent Spiner, Levar Burton and Michael Dorn. Once that was out of the way we decided to head back outside for some food. I will say the Excel is a fantastic venue. So geared up for large events like this. There are plenty of places to eat and enjoy a well earned coffee and seats are plenty. The facilities are also plentiful and relatively clean. Also the air conditioning can cope easily with thousands of Star Trek fans. A big difference to other convention centres I've been too. I headed over to the museum area where there were some impressive exhibits. Costumes, props and others were all on display. A very impressive display. 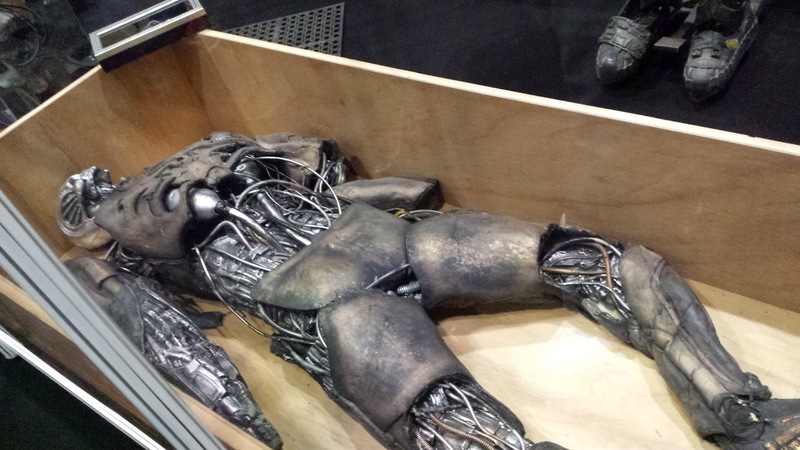 I particularly liked the Tin Man model from the Star Trek The Next Generation episode of the same name. Also seeing some original cast molds of Odo and some of the Ferengis were interesting to see. 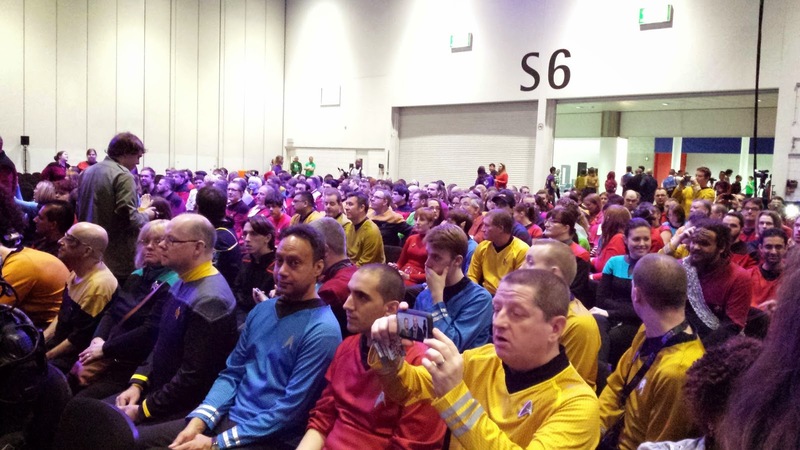 It wasn't long before the opening ceremony was upon us and we all piled into the main stage named Enterprise. Jonathan Ross was our host and did a good job at keeping the fans entertained and interviewing each guest who came out. William Shatner, Robert Picardo, Anthony Montgomery, Nichelle Nicholls and so many more were each introduced on stage and asked a few questions. It was entertaining but I get the impression that some of the guests didn't know what to make of the humour of Jonathan Ross, especially Nicholas Meyer who was getting asked about Ricardo Montalbán's chest. He did look a little awkward. Opening Ceremony over with we were not finished yet. We still had the Friday night party which was a Risa themed party. That was taking place just outside the venue at the Fox-Excel pub. First we had a plan. We would head to the posh hotel across the way and have a drink in the bar. You never know who you may see in there. Sure enough as soon as we walked in we passed James Darren on the stairs. I couldn't resist saying I was looking forward to hearing him sing tomorrow. He said thanks and was also looking forward to it too. 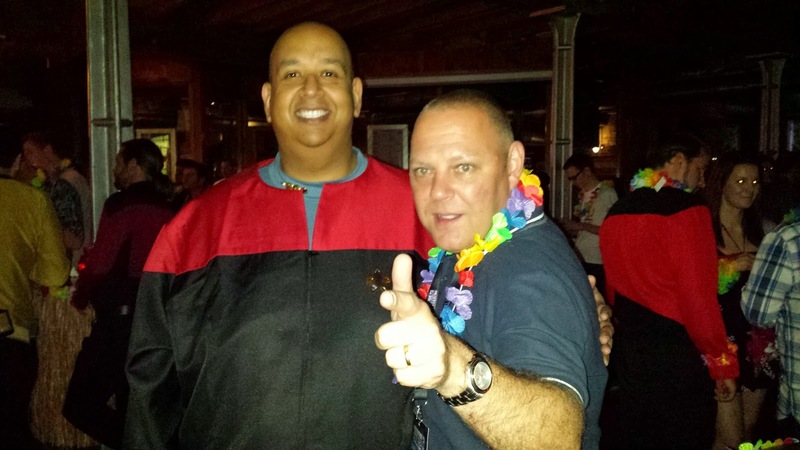 We also saw Max Grodenchik sat with Aron Eisenberg enjoying a drink. Nicholas Meyer was also there too looking for the restaurant. Of course we didn't disturb any of them. As we entered the Fox-Excel we realised already that the place was buzzing. Two girls were on the entrance placing lei's over our heads. Naturally we headed to the bar. Although busy the bar staff were on the ball and wasn't long before we were armed with our drinks. 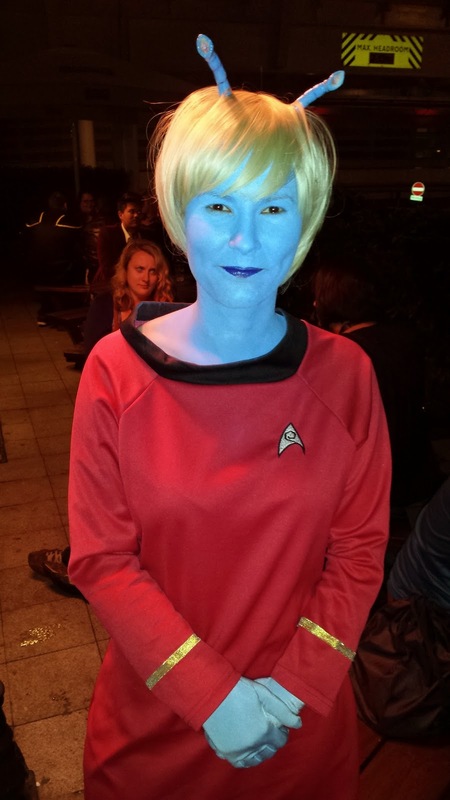 The pub were doing Star Trek themed drinks but they were £8 a glass. Also, it would be nice if next time they do these drinks they could do some with no sugar in them for us diabetics. Trek fans talking to Trek fans. We settled near the stage. There were a few people in Star Trek outfits and it was nice to know that everyone there had a similar interest. It made the place feel really friendly and I could see strangers talking about their favourite Star Trek episode and other Trek related topics. A really nice feel. Our entertainment for the evening was provided by the Enterprise Blues Band. The band is made up by Casey Biggs, Vaughn Armstrong & Steve Rankin and they were incredible. I only wish they had CDs for sale on the night. You can follow them on their Facebook page. The party over we headed back to our hotel. A long day but buzzing. 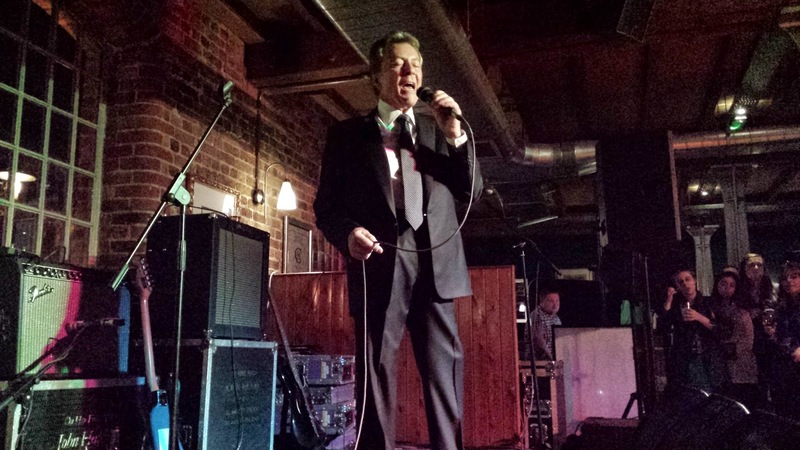 Saturday was going to be even busier with more photo shoots and James Darren live on stage! A 6:30am start after getting to sleep around 3am. Lack of sleep and one too many beers was soon sorted by a full english breakfast in a cafe just outside the Excel. Today was different though. Today we were cosplaying. My friend had his Kirk Wrath of Khan outfit on and I decided to represent Enterprise by wearing Mayweather's jumpsuit. Would we last the whole day in the outfits? Record attempt didn't go too well. We were up early as the world record attempt for most Star Trek fans in costume was to be held at 8:30am. An unusual decision was the general feel as a lot of fans would be travelling down today and miss the attempt. Sure enough the attempt was a little bit of a let down as only around six hundred fans were present. The good news is we still hold the record from 2012 when just over a thousand fans were all dressed up. Feeling a little dejected I'm sure the events of the day would make us forget this little hiccup. My first port of call was a photo shoot with Colm Meaney. The queue moved quickly but the brief contact I had with Chief O'Brien I could tell the guy was nice and a polite person. We had tickets for an Enterprise photo shoot for the Sunday but since we were in the gear we asked the staff if we could do it today. "Sure, no problem" said a member of staff. So we hopped onto the bridge for our photo shoots. There was no queue and after seeing the queues later on in the day we were glad we did this now. I must say both my friend and myself were disappointed with the quality of the photos. They were rather dark and the angle not that good. I had a gap between photo shoots now so listened in on a few free talks taking place. One was to determine the best episode of The Next Generation which I enjoyed and a quiz too which I must say I struggled with. I need to do more research. I checked out a few more stalls and bought a few things. (Morn figure amongst other things.) I headed over to the autograph area. As I was in Mayweather's costume from Enterprise I decided to get his autograph and see what he thinks. First I had to buy a 10x8 photo. These were £3 or four for £10. Once done I bought my token. Unlike other conventions you couldn't go up and pay at the booth. You had to get a token first from the autograph sales desk. A little strange but since they were right by the signing booths it didn't make much of a difference. There were no virtual tickets either which I guess could be a bit of a problem for those guests who had large queues. I headed over to Anthony Montgomery who straight away was commenting on my costume and he loved the fact that I had got the rank pip and the NX-01 T-Shirt underneath. I talked to him about his graphic novel, Miles Away and he took my card as he wants to contact me to promote his book. He was a really down to earth guy and I certainly recommend having a chat with him if you get the chance. While in the autograph area I decided to buy another token for Colm Meaney and just monitor the queue. It was rather large at the time. I did queue up for a while but a lady in front was constantly moaning about everything so I decided to come back. Two more photo shoots were ticked off, James Darren and Robert Picardo. Swiftly done and the staff outside and inside the booth were both happy and having a laugh. Next came the one I was looking forward to the most. 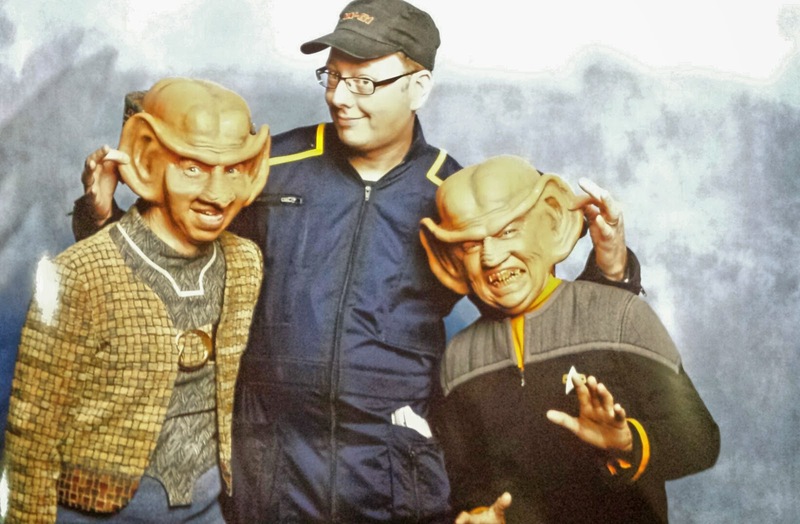 A photo shoot with Rom and Nog in costume. I heard the casts and costumes were the original that were donated for the event so I was hoping they would look good. I wasn't disappointed. I decided to make the most of it and asked if I could give them Umox in the photo. They both said yes but Max I must say looked a little confused by this request but Aron loved it. I love the photo and it's my favourite photo from any event. That was me done for the day and I headed back to the hotel around four. A couple of hours chilling and to take off my costume was an idea I was happy with. On the way back to the hotel I got stopped by a film crew who asked if I could wait to go pass as they were filming a scene for a movie. The bridge was cornered off as I saw the scene in question. A car chase scene with two police bikes. I later found out the movie is called Criminal and stars Kevin Costner and Tommy-Lee Jones. Back at the hotel I took a few hours out before returning for the party. I was just a few hours away from watching Vic Fontane on stage! Tonight's theme was Casino night to keep in theme with Quark's Bar. There were a few more there tonight but the pub could handle it. I stood by the side of the stage. Then I looked around and James Darren was standing next to me waiting to be introduced on stage. Once he headed up on stage and started singing I had goosebumps the whole time. What a smooth individual James Darren is. A few times the cable came loose from his microphone but played it with ease. Not once phased. Even when they played the wrong song after he introduced it he was straight on the ball with a response. I cannot believe he's 78 years old. His voice is magical and I had a smile on my face hours after he had finished. The whole venue was erupting with affection for Vic, I mean James and some took to dancing. I only wish my wife had been here who unfortunately couldn't make the weekend. Our first dance at our wedding was James Darren's The Way You Look Tonight. I looked to my left and stood next to me was Robert Picardo enjoying the singing. He explained how James Darren had been to his house and then he went to James Darren's house later. Lucky. Casey Biggs was stood by the side door listening too and he said this guy's on another level. On the other side was Max Grodenchik in amongst the crowd. I said to my friend, what other big franchise would you see the stars mingling with the fans? I love being a Star Trek fan. 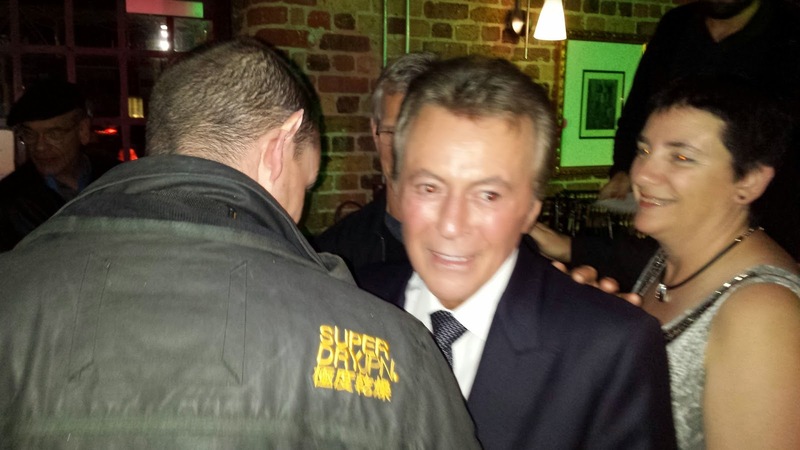 As with the previous night, I was disappointed James Darren wasn't selling CDs and I asked him why. He said he wasn't allowed to. I would have loved to have got a CD with his signature on it. Once James Darren had left it was time for Tim Russ to get on stage and sing. He was good but I couldn't understand why the crowd was bigger for Russ than it was for Darren. After the entertainment was over we headed over to "that posh hotel" again. James Darren was enjoying a well earned drink. Scotch on the rocks (what else?) and Tim Russ joined after his performance. He was happy to have a chat but no photos. He explained that if you do one then you will end of with a crowd. 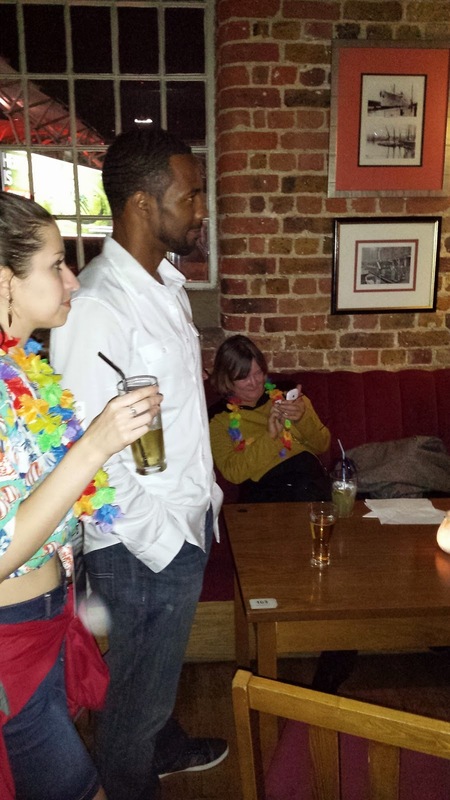 I completely understood and after all he's there to enjoy a drink. Max was in the hotel again browsing the public internet booths. He looked confused. It was like Rom trying to sort out his taxes. We had second wind so headed back over to the party and a disco was in full flow. I really enjoyed this and ended up talking to many Star Trek fans all evening and having a dance (if you can call it that.) It was another 3am finish. A shorter day today. I had no photo shoots but my friend did. We were leaving at 1pm today so felt a little deflated. I headed over to the autograph area and after last night's James Darren show I decided I would change my mind and have James Darren's autograph instead of Colm Meaney. I queued up but there was no sign of any of the guests. The staff tried there hardest to find out but we were getting conflicting reports. Some said he was in the building while others said he hadn't turned up yet. Then someone said that normally they get in about 11am. As it was just after 10 I thought I would come back. Sure enough apart from Jeri Ryan who was there just after 9am all the guests including William Shatner and James Darren all turned up at around 11am. I wonder if next time they should just start the signings at that time? There were a number of fans waiting for two hours. With Vic's autograph done and my friend, Chris having had all his photo shoots done we headed over to the Nichelle Nicholls talk with Robert Picardo. I final event of the weekend. That was it! It was over. We were sad to leave. We had a wonderful time. The venue was perfect for this event. Media 10 and Showmasters had everything under control. The staff were all friendly, even the guards on the entrance and exits. The parties were the best thing of the weekend and I want more of those. I did feel the numbers were slightly down on the 2012 event but that did have the five captains attending. With the 50th Anniversary coming up in 2016 I hope they return to the Excel. I will be there for sure.